3D Biomatrix’s Perfecta3D® Hanging Drop Plates, which are easy-to-use 96- and 384-well plates for controllable three-dimensional (3D) spheroid culture, will be featured in two upcoming webinars. A researcher from GlaxoSmithKline (GSK) will present the first webinar, on how the Hanging Drop Plates can be used to improve drug attrition, and in the second, 3D Biomatrix’s Applications Director will discuss the use of the Hanging Drop Plates in automated cell culture. Perfecta3D Hanging Drop Plates are available in 384- and 96-well formats. These webinars highlight two aspects of 3D cell culture that are critical to pharmaceutical researchers: building 3D drug screening models to improve drug attrition and the ease of using 3D cell cultures with the Perfecta3D Hanging Drop Plates. 3D Biomatrix, a leader in three-dimensional (3D) cell culture products, is pleased to share that its Perfecta3D Hanging Drop Plates will be featured in two free webinars in October 2013. One of the webinars will be presented by a researcher from GSK, and will focus on how the pharmaceutical industry can benefit from utilizing three-dimensional (3D) cell cultures. In the other webinar, 3D Biomatrix’s Applications Director will talk about the use of the Hanging Drop Plates in automated cell culture. In the first webinar, held on October 8, 2013 at 10:30 AM EST, GSK’s Jean-Louis Klein, Ph.D., will present on how 3D spheroid cultures can be used to improve drug attrition. Dr. Klein will present on the potential of using 3D cell cultures throughout the drug screening pipeline, and on his existing data on creating 3D spheroid cancer models for high throughput screening. In a webinar on October 17, 2013 at 12:00 PM EST, 3D Biomatrix’s Applications Director, Nicky Slawny, Ph.D., will discuss the use of the Hanging Drop Plates in automated cell culture. Dr. Slawny will elaborate on the many automated liquid handling and imaging systems that are compatible with the Hanging Drop Plates to analyze 3D spheroids in a high throughput format. “These webinars highlight two aspects of 3D cell culture that are critical to pharmaceutical researchers: building 3D drug screening models to improve drug attrition and the ease of using 3D cell cultures with high throughput equipment with the Perfecta3D Hanging Drop Plates,” said 3D Biomatrix CEO Laura Schrader. 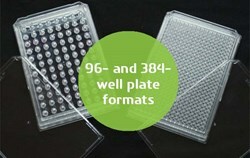 The Hanging Drop Plates, which allow for controllable 3D spheroid or embryonic stem cell cultures in a 96- or 384-well plate format, simplify and streamline spheroid formation, culture, and subsequent testing of the 3D cellular constructs without the aid of coatings or matrices. Such cultures grown in Perfecta3D Hanging Drop Plates allow researchers to easily mimic tissue metabolic and proliferative gradients, capture complex cell-matrix and cell-cell interactions, conduct co-cultures, and monitor cell growth easily and regularly. More information on the Perfecta3D Hanging Drop Plates and how to sign up for the free webinars can be found on the 3D Biomatrix website.